Handy Nick is here to help you run your home or business as it should. Its the smallest things that make the biggest difference and getting around to managing all those little jobs can be difficult, if not time consuming. This is why Nick is available to work at a time that suits you, including evenings and Saturdays. 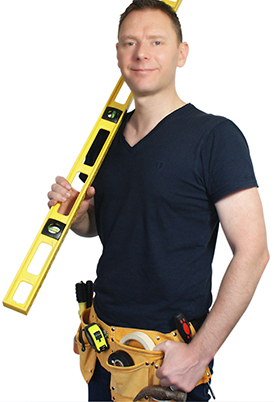 Homes, businesses, schools and landlords, if you need a handyman, Nick has an up to date Enhanced Criminal Records Bureau Check which means Nick is safe to work in child and vulnerable adult environments. Nick is also a full member of 'The Guild of Handymen' and follows there code of conduct at every job. Fixing, renewing, installing, dismantling unblocking and restarting in Plumbing, carpentry, decorating, construction, odd jobs, gardening and general labouring. These are specialities that Nick the handyman is fully experienced in. Covering the whole of Manchester and beyond, even further by appointment.